Try Our Same-Day Delivery Services! You’re busy, and you need stuff. We’ve got the stuff, and we’re making it simple for you. Come in, shop online, text us, or give us a call. We’ll hop in one of our cool vans and be knocking on your door before you know it! Five bucks will get you same-day delivery for any size order. Spend a hundred bucks or more, and you can pocket the five. We’ll get your order to you the same day for free at your home or workplace. Business orders are welcome too. As I said, we’re making it simple. Of course, there is a bit of fine print. We’ll do our best to offer you “sudden service,” but when it’s busy, we’ll need a three-hour window to process and deliver your order. For any special requirements, like big grills needing assembly and going up three flights of stairs, we’ll work out the details with you to get it just right. How do you pay us? In the store, on the phone, or online. Or our staff will gladly swipe your plastic upon delivery. That’s it. Simple. Give it a try and see. And thank you for keeping it local. When You Need to Make Keys, Cole Hardware Can Help! As part of our locksmith services, we cut and make keys at all our stores, including hard-to-replicate computer ChipKeys for automobiles. We have an expert locksmith on duty Monday through Friday at our Downtown store—call (415) 200-3444. Click here to read more about Marc’s services! You can bring your old paint (liquid paint only—put dried paint cans into your own recycle bin, lids off), used rechargeable batteries (nickel-cadmium), used household batteries (alkaline and regular), copper and brass scrap metal (such as keys, bathroom and plumbing fixtures), cell phones, expired printer cartridges, soft plastics (Rockridge store only), spent small propane tanks (San Francisco stores only), spent fluorescent bulbs, and mercury thermostats into any of our stores, and we will send them off to be recycled into new products. Thanks to our friends at TerraCycle we can now recycle your clean single-use coffee pods and empty toothpaste tubes! We will ship them to TerraCycle, an innovative recycling company that has become a global leader in recycling hard-to-recycle waste. Looking for that perfect pink? Exact eggshell? Specific sienna? We have terrific paint matching computers. Bring in a swatch of fabric or a quarter-size paint chip, and our staff can match just about any color. In addition, we can match our line of Benjamin Moore paints to the colors of many other brands on the market if you know the name of the color. Is your kitchen cutlery dull, making your gourmet dishes a bit difficult to prepare? Professional knife sharpening is available at all locations on alternating weeks. Our craftsman Matt can also sharpen serrated knives, scissors, shears, axes, chisels, garden tools, food processors, mandolins, and paper cutters. He can also repair knives. Contact store for dates and times or see our events calendar. We offer knife sharpening while you wait at all locations. 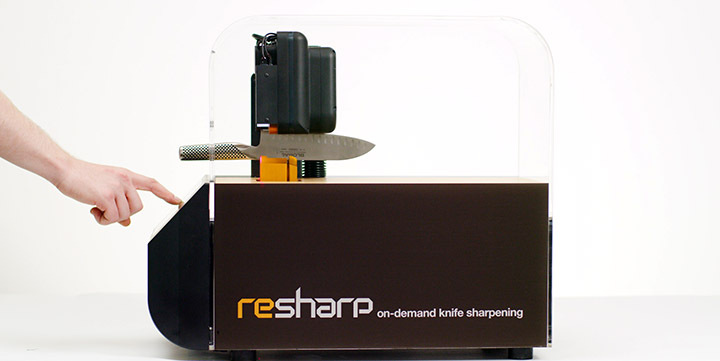 Resharp® your knives at any of our locations with our new Resharp patented grinding, blade-sharpening machines. With unprecedented speed, you get all your knives sharpened in a fraction of the time of other methods, about a minute per knife. The Resharp system sharpens American, European, Japanese manufactured knives with a V-shaped bevel. Unfortunately, it does not sharpen serrated, scalloped, single bevel or ceramic knives. Bring in your chef, paring, slicing, chopping, Santoku, pocket, hunting, and specialty knives to sharpen while you watch. Need some wood or pipe cut? Let us do the work for you. Our stores offer cutting services on a variety of products: pipe, wood, window shades, glass, and plexiglass. See store for details and prices on cutting services. We rent tools, rug cleaners, and moving totes! Do you need to drill holes in order to hang that new planter? Do you want to cut a few pieces of wood to make some shelves? Maybe you need to use a post-hole digger to fix your backyard fence, or you want to get those carpets cleaned before company comes over this weekend. Or you want to finally fix the drip coming from your showerhead, but you don’t have the wrench that will reach deep into your tiled shower wall. Projects like these take special and often expensive tools. And let’s face it, even though we’d love to sell them to you, not everyone can afford them, has the space to store them, or has an interest in developing their own tool collection (that one’s tough for us to understand!). We came to these realizations years ago and have been renting the tools that we sell ever since. If you ask (and ask, you do), we will gladly get our drill, extension ladder, or 100-foot extension cord and rent it to you by the day. In fact, we rent tools, ladders, rug cleaners, garden shovels, moving totes, and much more! Our tool rental assortments vary by location. Just inquire at any of our locations. All San Francisco Cole Hardware locations are UPS Access Points™. Being at home for package deliveries isn’t always convenient when you’ve got places to be. Shipping your online purchases to your workplace or office can be awkward if a colleague mistakenly opens a package. That’s why Cole Hardware’s North Beach, Russian Hill, and SoMa locations are now part of the UPS Access Point network that offers you a safe place to pick up your shipments—at your convenience. Redirect your packages to Cole Hardware before UPS makes a first delivery attempt to your home with a UPS My Choice membership. You can even choose a default location to send your packages for free. If you are not home when UPS attempts to deliver your package, they will drop off your package with us for you to pick up. This way, it’s not sitting on your doorstep for anyone to nab. Just bring identification with you when you come to retrieve your delivery. Shopping for shoes and clothes online can often result in the need to return merchandise if it doesn’t fit or the quality isn’t what you want. You can now drop off your return packages with us too! Just make sure it has a UPS return label. No need to find a UPS store. And with our everyday hours of 8:00 am–8:00 pm at North Beach and Russian Hill, and 8:00 am–6:00 pm at SoMa, you can pick up or drop off a package on your time frame. UPS My Choice also allows you to print labels and then drop packages off with us to ship your cookies and gifts to family and friends across the country. Our Cole Hardware Supplies crew serves commercial customers that range from property management firms, Bay Area municipal entities, and various county and city agencies. 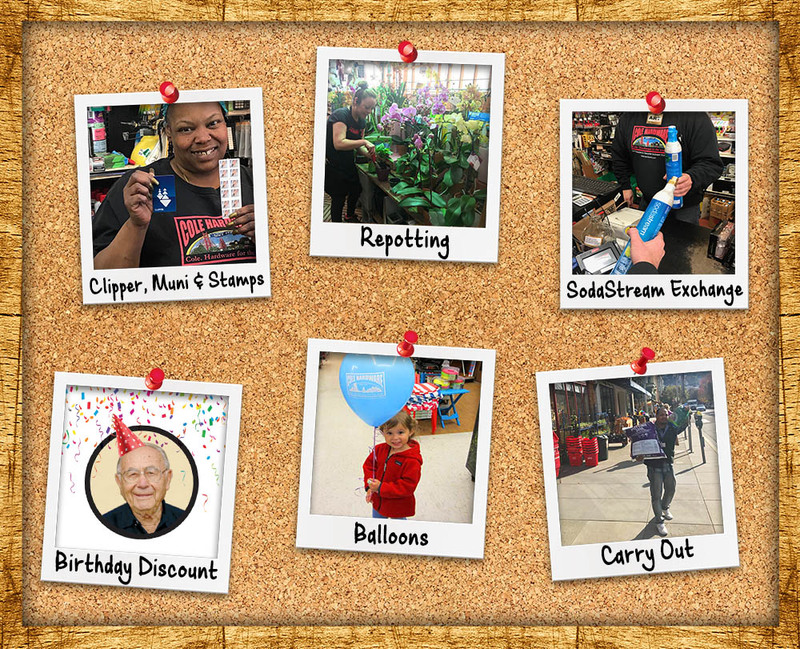 Specializing in creating low-cost, customer-friendly programs, the Supplies team’s expertise is in sourcing hard-to-find items and large quantities at the lowest cost. And we offer friendly, free delivery with this service too. Click here to download a PDF of our ever-growing list of services!